Being in a traveling trade myself, I know the problem of asking someone in a strange city for the best restaurant in town and being led to some purple palace that serves "Continental cuisine" and has as its chief employee a menu-writer rather than a chef... a three-paragraph description of what the trout is wrapped in, how long it has been sauteed, what province its sauce comes from, and what it is likely to sounds like sizzling on my platter - a description lacking only the information that before the poor trout went through that process it had been frozen for eight and a half months... What is saddest about a visitor's sitting in the Continental cuisine palace chewing on what an honest menu would have identified as Frozen Duck a l'Orange Soda Pop is likely to have passed a spectacular restaurant on the way over. Long-time visitors to Eureka may recall and mourn places like Lazio's and Weatherbee's, gems that served locally caught fish. There's now a Subway where Weatherbee's was; you can buy yellowed postcards of Lazio's on eBay. But from our observations there are an increasing number of food purveyors who are seeking out the best Humboldt has to offer. The resurgence of farmer's markets, local bread bakeries, cheesemakers, chocolatiers, etc., would not be possible without a customer base willing to buy fresh food from small businesses. Humbrews (as it's known locally) looks tiny from the outside, but is actually a long space with plenty of tables, a hammered metal bar, pool tables, surfboards lining the walls, and fast, friendly service. Clientele was a lively mix of students, parents, professionals, old hippies, and families. 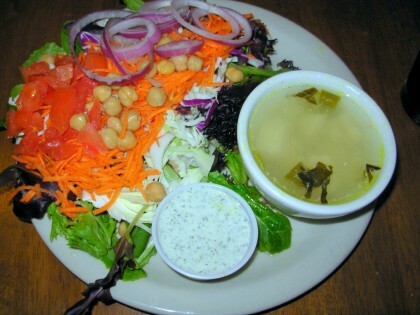 Expecting to see a small bowl of bagged salad greens with bottled dressing, this gigantic plateful of fresh local greens and vegetables came as a wonderful surprise. Tzatziki dressing was tart with yogurt and lively with dill. House-made curried chicken soup, pleasantly masala-scented, was light and warming on a cold night. The plateful was a generous-enough serving to be dinner. 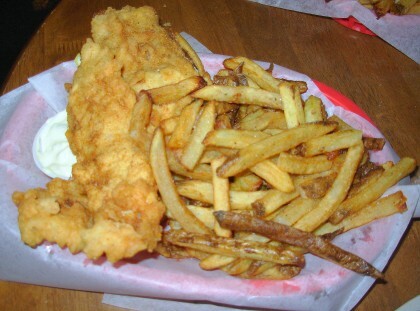 The vast majority of the time, fish and chips in a restaurant are uniform rectangles out of a freezer box, all too often a fish "product." Not at Humbrews. This was actual snapper filets fried in a beer batter. Non-greasy, tender, and without a "fishy" aroma or taste, three very large pieces were far more than expected, along with a huge portion of fries and house-made tartar sauce. A winner. 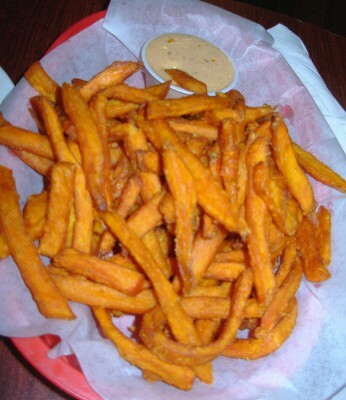 Femme de Joie doesn't know what kicked off the current craze for sweet potato fries, but it's one she approves of, though most are edible but undistinguished. These were made at the restaurant, served very crisp, and accompanied by an addictive chipotle-honey-ranch sauce. One serving = lunch. Vegans are served well at Humbrews. 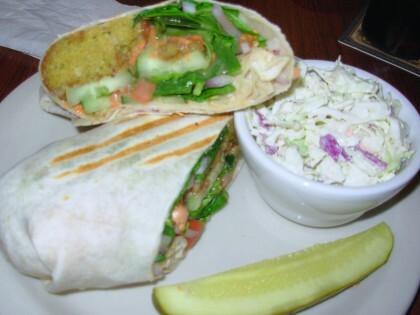 This falafel (garbanzo fritters) wrap packed with veggies and bound with a delicious lemon-sesame dressing was substantial enough that you'd never miss meat. If you didn't know it was vegan, you wouldn't guess. There was enough that M. de Joie wrapped half of it to go. Arcata is a college town, so on Friday and Saturday nights the emphasis at Humbrews is almost certainly more on brewskis than on food. But the crowd is friendly, the food is quite good, and the restaurant is large enough to accommodate families and groups. There are frequent live music nights in the next-door venue; artists as well known as Leon Russell, New Riders of the Purple Sage, G. Love with Special Sauce, and Jackie Greene have performed there. The next time you're escaping the Redding summers, try it out.